Wall Mount Waterproof & Bluetooth Speakers, 6.5 Indoor/Outdoor SPECIAL OFFER! What s in the Box: (1) Active Speaker (1) Passive Speaker 12V DC Power Adapter Speaker Connection Cable, 16' Ft. Technical Specs: Marine Grade IP44 Rating 6.5”' Long Throw Woofers MAX Power Output: 300 Watt RMS Power Output: 30 Watt 30 Watt 1.0'' Polymer Dome Tweeters Magnet Size: 10 oz. Cone Material: PP Mica Rubber Surround Frequency Response: 80Hz-20kHz 8 Ohm Impedance Power Supply: 110/240V Dimensions (L x W x H): 8.4'' x 7.5'' x 12.1'' Sold as: Pair Features: Includes (2) Speakers (Active Passive) Built-in Digital Sound Amplifier Bluetooth Wireless Music Streaming Marine Grade Waterproof Construction Aux (3. Wall Mount Waterproof & Bluetooth 5.25" In/Outdoor System SPECIAL OFFER! The Pyle PDWR52 mountable speaker systems provide high-powered wireless Bluetooth performance -- indoors or out! Featuring rugged marine grade waterproof construction, they are the perfect choice for adding full range stereo sound on boats, decks, patios or backyards. The system includes (2) speakers; one active and one passive, along with a built-in digital amplifier. Once connected, the polymer dome tweeters create crisp high frequency sound and the fortified long-throw woofers generate some impressive bass. Built-in Bluetooth audio streaming ability allows you to connect and stream audio from all of your favorite devices, quickly and easily (works with iPhones, Androids, Smartphones, Tablets, Laptops, Computers, etc.). JBL Surround Sound speaker system, as shown. This was installed and working in our old house, was removed working. Very nice black wood cabinets to accent most decor. My late husband was really into audiophile stuff, and was really picky about his speakers. We will make every effort to. ANY REASON. In case you are. Pyle PDWR62BTBK. The Pyle PDWR62 mountable speaker systems provide high-powered wireless Bluetooth performance -- indoors or out! Featuring rugged marine grade waterproof construction, they are the perfect choice for adding full range stereo sound on boats, decks, patios or backyards. Pyle PDWR64BTB Waterproof and Bluetooth 6.5" Indoor/Outdoor Speaker System, 800 Watt, White, Pair. SPEAKERS: Pyle PDWR64 mountable speaker systems provide high-powered wireless Bluetooth performance indoors or out! Bluetooth Wireless Music Streaming. Bluetooth Version: Bluetooth 3.0. Ability to Daisy-Chain Active Speaker to Passive Speaker as Stereo System. Single RCA Speaker Output Connector Jack. Active & Passive Speaker System. (Dolby Atmos audio available on select titles.). Digital music for audiophiles, with higher sampling rates and bit depth, both of which can contribute to more accurate, more enjoyable music listening. Nice lot of 5 Panasonic SB-AFC280 shelf speakers. Condition is good, speakers work fine. No cracks on any speaker case. Screens as shown. Connectors in back are all great. Each speaker weighs a bit over 3 lbs. Back panel will pulled from working Bose Am5. Tested both line. (Highly sought-after original Energy Take 5 speaker system. Dual woofer single tweeter center speaker, four single woofer tweeter fronts and rears), fully functional. Made in Canada. Sony SS-WS300 Subwoofer & SS-TS300 5 Speakers Surround Sound System Good WORKS! pre-owned, good condition. Working! Included is an instruction manual, cords, woofer (SS-WS300), and 5 surround sound speakers (SS-TS300). See photos! 3 out of 5 stars - Sony SS-WS300 Subwoofer & SS-TS300 5 Speakers Surround Sound System Good WORKS! 2 product ratings2 product ratings - Sony SS-WS300 Subwoofer & SS-TS300 5 Speakers Surround Sound System Good WORKS! This 5-piece system features Athena's Teteron tweeter technology and high-end design touches in a very compact size. Enjoy spine-tingling surround that won't overtake your decor. HONESTLY SYTEM LOOS UNUSED AS THERE IS NO SIGN OF USAGE. The Bose Solo 5 TV sound system – Factory Renewed is a one-piece soundbar that brings noticeably better sound to all your favorite tv programs. It’s engineered to help clearly reproduce everything from dialogue to details. 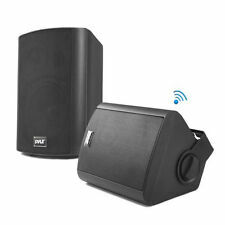 Pyle Pdwr52btbk Speaker System - 40 W Rms - Wall Mountable - Wireless Speaker[s] - Black - 80 Hz - 20 Khz - Surround Sound - Bluetooth - Wireless Audio Stream, Water Proof, Stain (pdwr52btbk). Manufacturer Part Number PDWR52BTBK. Pyle PDWR52BTBK. 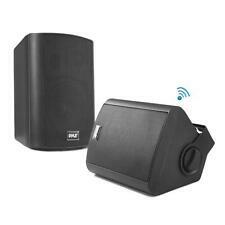 Wall Mount Waterproof & Bluetooth 5.25" Indoor / Outdoor Speaker System Black. Bluetooth Version: Bluetooth 3.0. Bluetooth Wireless Music Streaming. Excellent for Monitor or Surround Sound Applications. Manufacturer Part Number PDWR64BTW. Product Model PDWR64BTW. The Pyle PDWR64 mountable speaker systems provide high-powered wireless Bluetooth performance -- indoors or out! Featuring rugged marine grade waterproof construction, they are the perfect choice for adding full range stereo sound on boats, decks, patios or backyards. This was an estate sale find. 1 x AV Subwoofer to Receiver Cable. These white Pyle indoor/outdoor waterproof speakers are excellent for use on boats, decks, patios, or by the pool - anywhere outdoors. And they're powerful - 250 watts max. A 5.25' long throw woofer with 40 oz. Model Number: PDWR62BTBK. Manufacturer Part Number PDWR62BTBK. Product Model PDWR62BTBK. Built-in Bluetooth(R) streaming. 6.5 Indoor/Outdoor Wall-Mount Bluetooth(R) Speaker System (Black). 30W RMS x 2. Model Number: PDWR64BTW. Manufacturer Part Number PDWR64BTW. Product Model PDWR64BTW. Built-in Bluetooth(R) streaming. 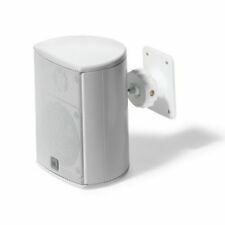 6.5 Indoor/Outdoor 800-Watt Bluetooth(R) Speaker System (White). 400W RMS x 2. Weight (Approximate) 27.57 lb. Model Number: PDWR64BTB. Manufacturer Part Number PDWR64BTB. Product Model PDWR64BTB. Built-in Bluetooth(R) streaming. 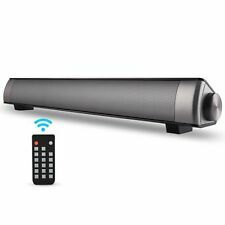 6.5 Indoor/Outdoor 800-Watt Bluetooth(R) Speaker System (Black). 400W RMS x 2. Weight (Approximate) 27.41 lb. The Pyle PDWR64 mountable speaker systems provide high-powered wireless Bluetooth performance -- indoors or out! Featuring rugged marine grade waterproof construction, they are the perfect choice for adding full range stereo sound on boats, decks, patios or backyards. The Pyle PDWR62 mountable speaker systems provide high-powered wireless Bluetooth performance -- indoors or out! Featuring rugged marine grade waterproof construction, they are the perfect choice for adding full range stereo sound on boats, decks, patios or backyards. Power: 2 x 5W. 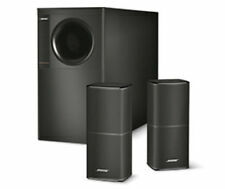 Feature: 2 x 5W subwoofers, SNR: ≥95db, hearing loudly and clearly. specification: Bluetooth Version: 4.2, support HSP,HFP,A2DP, AVRCP. 1 x Bluetooth Speaker. Built-in Bluetooth 4.2V connecting more stably and quickly. Pyle Pdwr62btbk Speaker System - 60 W Rms - Wall Mountable - Wireless Speaker[s] - Black - 80 Hz - 20 Khz - Surround Sound - Bluetooth - Wireless Audio Stream, Water Proof, Stain (pdwr62btbk). Product Title Pyle PDWR62BTBK Speaker System - 60 W RMS - Wireless Speaker[s] - Wall Mountable - Black. Pyle Pro Wall Mount Waterproof & Bluetooth 6.5" Indoor / Outdoor Speaker System. The Pyle PDWR62 mountable speaker systems provide high-powered wireless Bluetooth performance -- indoors or out! Featuring rugged marine grade waterproof construction, they are the perfect choice for adding full range stereo sound on boats, decks, patios or backyards. Manufacturer Part Number PDWR64BTB. Product Model PDWR64BTB. The Pyle PDWR64 mountable speaker systems provide high-powered wireless Bluetooth performance -- indoors or out! Featuring rugged marine grade waterproof construction, they are the perfect choice for adding full range stereo sound on boats, decks, patios or backyards. 4 x Surround Speakers. 1 x Center Speaker. Fully Functional System. The Pyle PDWR52 mountable speaker systems provide high-powered wireless Bluetooth performance -- indoors or out! Featuring rugged marine grade waterproof construction, they are the perfect choice for adding full range stereo sound on boats, decks, patios or backyards. Pyle Home Indoor-Outdoor Wall-Mount Bluetooth Speaker System Black - 6.5 in. The Pyle 6-1/2 in. Indoor/Outdoor Wall-Mount Bluetooth Speaker System provides high-powered wireless Bluetooth performance, indoors or out. Featuring rugged marine-grade waterproof construction, it is the perfect choice for adding full-range stereo sound on boats, decks, patios or backyards. 4 out of 5 stars - Pyle Home Indoor-Outdoor Wall-Mount Bluetooth Speaker System Black - 6.5 in. 19 product ratings19 product ratings - Pyle Home Indoor-Outdoor Wall-Mount Bluetooth Speaker System Black - 6.5 in. Bt blast pro Bluetooth indoor/outdoor weatherproof speakers from are a leap forward in technology. The bt blast pro will stream music up to 60 feet away from your android, iPhone or other Bluetooth enabled device. Support Bluetooth connection, fully compatible with most kinds of Bluetooth devices, wireless playing, do follow your heart. It gives you a theater level sound experience. This wireless soundbar with Bluetooth let you enhance your TV experience with crisp dynamic sound. 1 Pioneer S-FCRW2500 Surround Sound Front Right Speaker Home Theater Replacement. Condition is Used. Shipped with USPS Priority Mail. Trending at $16.62eBay determines this price through a machine learned model of the product's sale prices within the last 90 days. Model Number: SK9Y. Pair this LG sound bar with any Bluetooth-compatible device for effortless music streaming. You just need another device with Google Assistant built-in like the LG OLED TV with AI ThinQ and LG ThinQ Speaker. Model Number: PDWR52BTBK. Manufacturer Part Number PDWR52BTBK. Product Model PDWR52BTBK. 20W RMS x 2. Weight (Approximate) 12.75 lb. 5.25 Indoor/Outdoor Wall-Mount Bluetooth(R) Speaker System (Black). Ordered wrong item. Never used. Only one speaker taken out of box only to find that it was the wrong size connector. These are the SMALL connectors & my unit was one size larger. The subwoofer is under speakers in picture & was never been taken out of box. Onkyo Fusion AV S-85 Passive Radiator Speaker System/5 Way/150 Watts Each.